This article has been under consideration for many years. Its publication now is not due to its completion, more to answer questions about my disagreement with many accepted dates of military masonry structures in the UK. This discussion is in no way supposed to be definitive, but it is intended to provoke thought, argument and, hopefully, comment. Much has been written about the dating of Medieval Military Architecture and many theories have grown up through the study of the so-called progression of building styles - from wood to stone - from square to octagonal to round. In tandem with this these styles have been named from Norman to Early English to Transitional etc etc. Now after many years formulation and study these 'standards' have solidified and become accepted. It is therefore necessary to re-assess the evidence for the value of these procedures, and here I intend to show that these now require re-evaluation. We must first start by examining the evidence on which we are basing these theories. First and foremost must be documentary evidence - archaeology is still far too imprecise a tool. How many times has a date of 1200 give or take 150 years been compressed to the far more practical, but totally illogical, c.1200? Anyone looking at our text books can see how the most tentative of dating attempts by an excavator tend to solidify into 'fact' over the succeeding 50 years or so. This happens all too often and the error is then compounded by similar structures being dated by comparison. Therefore we date one structure by taking an unproven and unprovable date from a totally different structure, often built by different lords and in areas of the country which have a totally different military history and tradition. This 'date' is then assigned to yet another somewhat similar structure and so the process goes on. How can any faith be put in such dating? To illuminate the point I will consider my family house. Late eighteenth century tithe maps show there was a cottage in an orchard where our house now stands. In the 1860's a new house with a lovely Victorian front was built on to the front and the cottage itself was altered to accommodate this. However when various 'experts' examine the house they all comment on our lovely 'Georgian' windows at the back. Undoubtedly the original builders used old materials in building the first cottages here. Or did they? Is it not possible that they were still producing fine 'Georgian' windows in the nineteenth century? To make matters worse that fine 'Victorian' door that obviously was the early entrance to the newly converted cottage was put there by us in 1970 when we moved it 10 feet from its original position, which itself was replaced by a window! There is now no obvious trace of this movement. The second Georgian window is even worse. After each tentative dating, I show our 'experts' the beam that marks the second extension to the house. This extension, to house the first floor bathroom, was added sometime in the 1920's, yet the builders reset either an original, or a second-hand window in the 1920's wall. Few, if any, ever spot this. Well you may be saying to yourself, this is a very nice discussion, but what has it to do with Medieval Military Architecture? The answer is that if so many mistakes can so easily be made with a reasonably well-documented modern building, then how can we trust dates given to us for much earlier buildings that are little better than picked randomly, if judiciously, out of a hat. You may think that this is an overstatement. In the following pages I intend to prove the point with a discussion of known castle building dates and what they prove. In Wales and the border region we are lucky in having had so much interest shown from castellologists over the years, and such a tradition still continues to thrive in this interesting and stimulating region. With all the available evidence, where is it best to start? Well it is probably best to start at known points and it must be admitted that the only area with really firm dating evidence is the Edwardian Conquest castles of North Wales. However even here our knowledge of the earlier tenurial history of these sites, viz Caernarfon, Buellt and probably Aberystwyth (3 earlier castles?) is sadly lacking. Caernarfon and Buellt have a history dating back to the earliest Norman invasions and Aberystwyth to only slightly later. Little research has been done on the early history of all three sites, especially the first two. It is possible that in Caernarfon this will have an effect on t he study of the masonry remains. From the plans of these royal castles, it is generally assumed that the baronial houses spawned their own comparable designs, viz Holt, Caergwrle (Hope), Ruthin, Denbigh and Chirk. But did the lords of these castles knowingly copy their king's designs? Was Roger Mortimer influenced by the North Welsh castles or in fact was Beaumaris based on Chirk? And what of Caerphilly and Morlais, the pinnacles of baronial castle building? A point in question may be Flint. If this had been more thoroughly ruined than it currently is - say all the walls and towers had now gone apart from the two southern walls of the baileys with the ruined entrances still set in them as they are now - what would be left? A turfed over mound of rubble or 'motte' where the keep had been (many turfed over collapsed keeps have in fact been mistaken for mottes), and two baileys which show little, if any, evidence of being flanked and had just simple hole-in-the-wall gateways. Who would not by current standards, on architectural grounds alone, date such a structure to the twelfth century? Without tenurial history and a complete ground plan (earthworks, not just masonry), preferably buttressed by excavation, any dating attempt is likely to be flawed. Even with the increasing abundance of documents concerned with castle building in the thirteenth century, it's rarely possible to be conclusive about a castle's origin. Yet we are prepared to date military structures to narrow, pre-conceived, non-contemporary bands, nearly always in total isolation from the tenurial history of the site. If our grasp of the architecture of the royal Edwardian castles of Wales is uncertain and incomplete, it is to be expected that our knowledge of less well-known sites is even less secure. Much useful work has been done on the career of William Fitz Osbern in Herefordshire and the border, but detailed work on his known and possible castles is generally lacking. 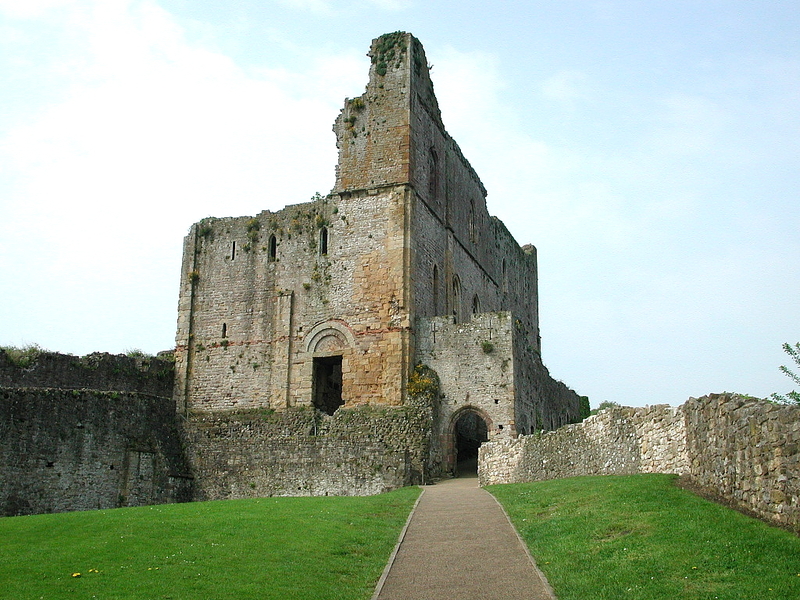 The building of the hall at Chepstow (shown right) is generally attributed to him or his son, Roger, before 1075, but proof of this is lacking. It is widely accepted, with the exception of Ludlow, that in Wales and the Marches between the dispossession of Roger of Breteuil (1075) and the reign of Henry II (1154 -89), no masonry castles were constructed. In my opinion this is largely due to a failure to take into account the tenurial history of castle sites. It is therefore necessary here to look at some of the available history for these fortresses. To keep this paper to a reasonable length I will attempt to limit this discussion to round towers. The standard view for round towers is that they are a military feature of the thirteenth century. This view is based on a handful of 'known' building dates which in themselves are not totally satisfactory, viz Beeston (SJ.537.593) 'circa' 1220-25 and Bolingbroke (TF.349.649 - 'early history unsatisfactory' - D.J. Cathcart-King) 'circa' 1220-32. Similarly Welsh style D-shaped towers are classified according to what little is known about Castell y Bere, allegedly commenced in 1221 as Llywelyn's castle in Meirionydd. In reality the earliest evidence we have for round towers in Wales is the event that occurred almost certainly in the winter of 1165/6, retold by Giraldus Cambrensis, concerning the death of Mahel, lord of Brecon. During the night the castle caught fire and whilst fleeing the holocaust a stone fell from the 'principal tower' on to Mahel's head. The linking of the tower on the motte to this event is currently rejected on architectural and no other grounds! 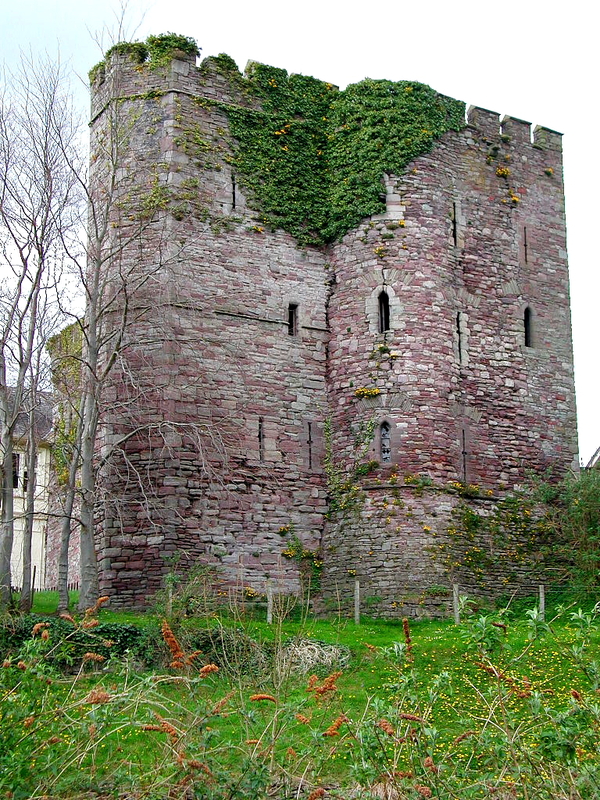 Instead the current tower is said to have been built by Walter Clifford (1207-68). Of him we have no evidence that he built or was even interested in building anything. He is accredited with the conception of this tower simply because he was the owner and was living 'circa' 1220-30 when it is claimed round towers were being built! The motte on which the tower stands shows evidence (bedrock) of being natural and must have been a primary feature of the site and therefore the castle's principal tower was most likely built upon this from the castle's conception, probably in 1144. The tower also shows evidence of burning and of having been altered internally several times, as well as of being heightened. Remains of a stone forebuilding can still be made out leading up to the entrance doorway from the bailey. If this tower is built on bedrock then there is no reason for it not having been built from the first - once again no need for settling of the 'motte' - and there is no reason to doubt that the windows could have been later insertions. Comparisons with similar round towers on mottes strengthens this argument. Buellt or Builth Wells Castle, as it is now known, was destroyed in 1169 by Rhys ap Gruffydd of Deheubarth and was later 'constructed' for King John in 1210. The site has always been reckoned to be the earthworks under the Edwardian castle. However just west of the current town is another motte and bailey, and on the motte are the buried remains of a round tower equivalent to those found at Bronllys and Longtown. This probable early tower-keep is quite likely the first Braose castle of Buellt, founded in 1093. This immediately brings into question Longtown's alleged date. Longtown keep has generally been dated to the thirteenth century, once again on no solid grounds. However in this case the historic dating evidence does point clearly (but of course without total certitude) to the period immediately prior to 1230, even though the castle appears to have been newly commenced in stone in the 1180's. The conclusion that the keep was built at this time from the dismantled remains of whatever preceded it is re-enforced by the re-used material in the round keep. This 'evidence' however, can be argued against on the sensible grounds that it is not conclusive. So too can the dating of any structure as I think has been adequately stated above. The above sites pose the question as to what conclusive evidence there is for twelfth century (and possibly older) round towers? One castle springs immediately to mind - Nevern in Cemais (SN.083.402). Here are the barely noticed remains of a round keep set in a motte; and although we have no building date for this structure we do have a destruction date - 1195! 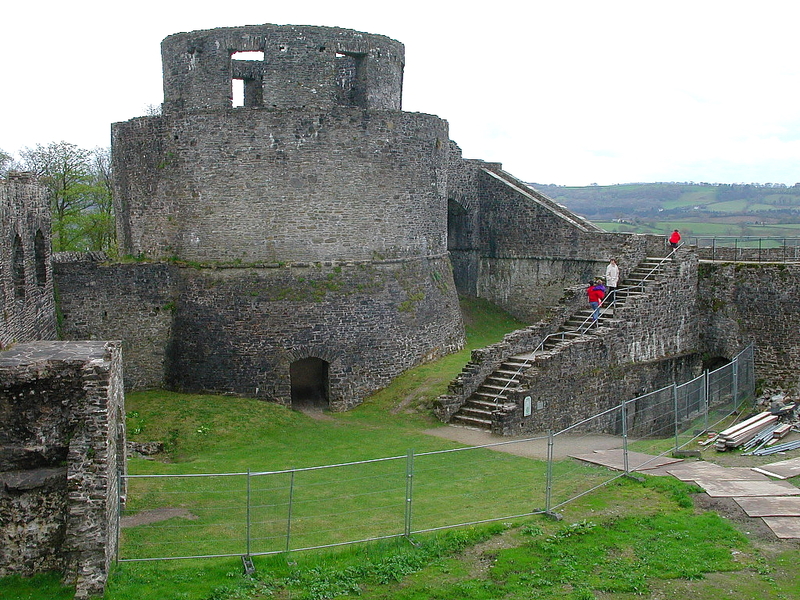 The castle itself was probably founded soon after the Norman occupation of Ceredigion in the reign of Henry I (1100-35), and it is possible that the keep was built soon afterwards on terra firma, as has been proved at Skenfrith and suggested at Clifford and Bronllys. According to an unfortunately secret excavation report, Longtown was built on the motte on the most insecure of foundations. In the other cases the mound was subsequently thrown up around the base of the keep, which was built on a solid foundation. There is therefore no need to wait for the soil above terra firma to settle. This brief resume helps confirm the view that round towers on mottes were built between the 1100's and the 1230's and not just in the early thirteenth century. It is also worth noting here what happens when the upper stories of such a keep are removed. You are left with a mound, possibly with rubble surrounding it or vaguely protruding from it. Such mottes/mounds which have been excavated revealing a masonry keep and are not mentioned in this text include Barnstaple (SS.556.334), Crug Eryr (SO.158.593), Dolforwyn (SO.153.950), Elmley (SO.980.403), Duffield? (SK.343.441), Kenfig (SS.801.827), Miserden (SO.944.093), Neroche (ST.272.158), St Briavels (SO.558.046), Castell Dinas Emrys, and Winforton (SO.302.463, probably not defensive). Those that show definite evidence of once having supported or having been towers include Bleddfa (SO.209.682), Caus (SJ.338.079), Chartley (SK.010.825), Clun (SO.298.809), Crickhowell (SO.218.183), Dolwyddelan I (SH.725.522), Lyonshall (SO.331.563), Mileham (TF.312643), Plympton (SX.546.559) and Wiston (SN.022.181). Those that show some evidence include Aberedw (SO.078.471), Dolbenmaen (SH.506.430), Eardisley (SO.311.491), Huntington (SO.249.539), several of the castles of the Radnor plain, Old Castleton (SO.283.457), Ongar (TL.554031), Oswestry (SJ.290298), Pilleth (SO.259.677) and Tomen y Mur (SH.705.386). This list is by no means exhaustive and no attempt has been made to list the sites chronologically. There are other such round keeps in Wales that may well be twelfth century. Probably the best such case is the keep at Dinefwr (below). A 'tower' here was strongly defended in 1213 after the rest of the castle had fallen. Such a tower is only likely to have been the present round keep. The 'tower' at Llandovery successfully resisted attack after the fall of the bailey in 1116. Once again the castle remains here have not been properly surveyed and, considering the tenurial history, in my opinion are most unlikely to date to 1282 and after. The castle of Rhaeadr-gwy in Gwrtheyrnion is another good example of a historically recorded, but now destroyed stone tower on a 'motte'. Built by Rhys ap Gruffydd in 1177 it was twice destroyed by the princes of Maelienydd, the last occasion in 1194 proving final. Here is an attested Welsh built stone tower with a terminus post quem and a terminus ante quem. It is unfortunate that so little of the structure now remains. Regardless of this, time and time again, round towers are dated to the thirteenth century on no grounds other than vague architectural assertions, viz. Dolbadarn, Pembroke, Cardigan, Usk, Penrice, Wigmore, Clifford, Bryn Amlwg, etc. What actual firm evidence do we have for the building of these structures? Can we really date them on the grounds of architectural features, the construction of all of which undoubtedly spanned many generations? There can be no hard and fast rule. Of all the historical documentation that may have existed about a castle site we probably are lucky if we can now muster 1% of it. The whole of that documentation probably covered but 1% of what we would now want to know about that site. Can we therefore really be so certain that Hay Castle was built c.1200 by Maud Braose, Bronllys tower was built c.1220 by Walter Clifford or even that Clifford Castle was built c.1220 by the same much put upon Walter? Merely on the evidence of windows which may have been replaced, most likely repeatedly, and styles that were neither fixed nor compulsory? The case of Nevern (above) opens interesting speculations. It is generally argued that the chief lordship castle was copied by the lesser baronial castles. In many cases this is demonstrably false, though this is not to say that it did not happen. If Nevern was a copy of the lordship round tower at Cardigan, then Cardigan's tower is logically older. The structure there is certainly unusual. It is said to be a stepped round tower with deeply projecting corner spurs, making the ground plan square, rather than round, though this may well be a confusion between the 'great tower' and the 'watchtower'. Were either of these built in the attested stone building of the castle by Rhys ap Gruffydd in 1171? Was the tower already there then, or was it the great tower whose second storey was constructed for Henry III in 1261? Even though we have a historical mention of building work at a castle, this cannot be taken as evidence that this involves the erection of whatever piece of masonry we are currently interested in. Any castle that has been adequately examined shows multiple building phases, and these indeed are to be expected over any length of time. It is not so much building evidence that we lack, but a sensible method of relating this to the castle chronology. Currently not enough research has been undertaken on the tower at Cardigan to even hazard a guess as to its construction date or its repair. The same should be true of Pembroke, for here we currently have little historical help. Giraldus mentions Pembroke Castle, initially hastily and roughly constructed in the form of a stockade. From this point he tells us stories of the siege of 1096, but of the later structure, which must have followed the rough and ready stockade, he tells us nothing. We know that the site was of great strategic importance during the twelfth century, yet it is not until "c.1200" when once again all the masonry was suddenly supposed to have been built, even if the Old Hall is allowed an unconvincing date of "c.1180". All of this architectural dating evidence is quoted despite the fact that Gerald of Windsor, the castellan, surrounded his new castle, which was probably at Cilgerran, "with a ditch and a wall (mur) and made gates fastened with locks and bars" as long ago as 1108! Indeed evidence of this apparently clay-laid wall (The idea that these castles were 'clay-laid' is almost certainly erroneous; the decayed masonry at Richard's Castle and Longtown Castle almost certainly prove this point) still remains under the later gatehouse and on the rock ledge beneath the castle's current north curtain wall. If Cilgerran was stone-built from the first then what of the myriad of other secondary castles that litter Wales and the border? There is evidence of long abandoned stonework at so many! Again the remains of the two round towers and linking curtain at Cilgerran are dated to after 1223 on the grounds that fighting was going on then and a re-fortification (refirmavit) of the site as an "ornate castle of mortar and stone" was attested. Was this a complete rebuilding of a derelict site or merely further additions to an already powerful masonry castle which had been the scene of the bitterest fighting since the 1160's. Cilgerran Castle had been taken by Rhys ap Gruffydd in 1165 and the next year twice resisted assaults by the Flemings to re-take it. It then remained in the hands of Rhys and his sons till his death in 1197. In 1199 it was taken by his son Gruffydd and in 1201 was taken from him by his brother Maelgwn. 1204 saw the castle seized by Walter Marshal, who then lost the castle with much of South Wales to Llywelyn in November 1215. In 1216 it was restored to Maelgwn ap Rhys the holder of 1204, before its re-fortification in 1223. This brings to the fore the question as to who did build castles. It has always seemed to be a long held view that a powerful ruler was more likely to build a substantial castle than a weak one. Hence the attachment of many masonry castles to well-known personalities viz. Richard of Cornwall, William Marshall, Walter Clifford etc. Yet how much weight can really be attached to these fleeting arguments? Was a great lord really more likely to build a masonry castle than an insignificant one - insignificant being directly related to short-lived, militarily unadventurous (he might have preferred building castles rather than fighting battles) or simply unrecorded? Roger Mortimer of Wigmore (1246-82) was undoubtedly the most powerful member of that family in the thirteenth century, yet it was his little-known father Ralph (1226-46) who was responsible for founding Knucklas and Cefnllys castles and probably several others! Death also struck at odd times and many a promising career was cut short by the hand of fate. In how many other cases may a short lived powerful and energetic lord be dismissed as irrelevant simply because their period of lordship did not span 40 years? This century our own political leaders have rarely lasted 10 years yet look what building works some of these have achieved! Powerful castles fell to an enemy through surprise or lack of will to resist. Rarely did they fall to determined attack. There are few well chronicled sieges in the Middle Ages. One of these is concerned with the siege of the powerful stone castle of Bedford in 1224. Bar the motte nothing at all can now be seen of this castle, yet we know it was once one of the most powerful castles in the kingdom, with two stone walled baileys and a round tower set in a round shell keep on a motte, of which we even have a contemporary drawing by Matthew Paris. We also know that it took the king two months and all the power of the kingdom to subdue this determinedly held castle. The first thing to be said about Bedford is that it was too strong for King Stephen to take in 1138 and that he had to resort to starving the garrison out. This suggests stone defences. When Faulkes Breaut gained the castle in 1215/6 he proceeded to strengthen it with 'towers and outer defences' and 'towers and walls and outer walls from the stones of the churches, and surround it on all sides with deep moats of pavement'. Deep moats of pavement would suggest strong reveting of the ditches due to the low lying nature of this probably wet site. It is worth quickly quoting here the main occurrences of the siege which began on 20 June 1224. The siege began with the outer ward being battered with mangonels and petraries. Subsequently the barbican was taken, then breaches were made in the wall of the outer bailey and this was next stormed with much loss of life. In return for their sacrifice most of the garrison ammunition, horses and livestock fell to the attackers. The king then ordered belfries constructed and whilst his archers maintained a murderous fire on all that moved in the castle, a tortoise breached the inner curtain by the 'ancient tower'. Again this ward was then successfully stormed with great loss of life. It was now necessary to undermine the keep on the motte and about Vespers on 14 August the wooden pit-props were fired and great gaps appeared in the shell(?) wall. The garrison then surrendered to the king's mercy and Henry ordered the castle demolished. 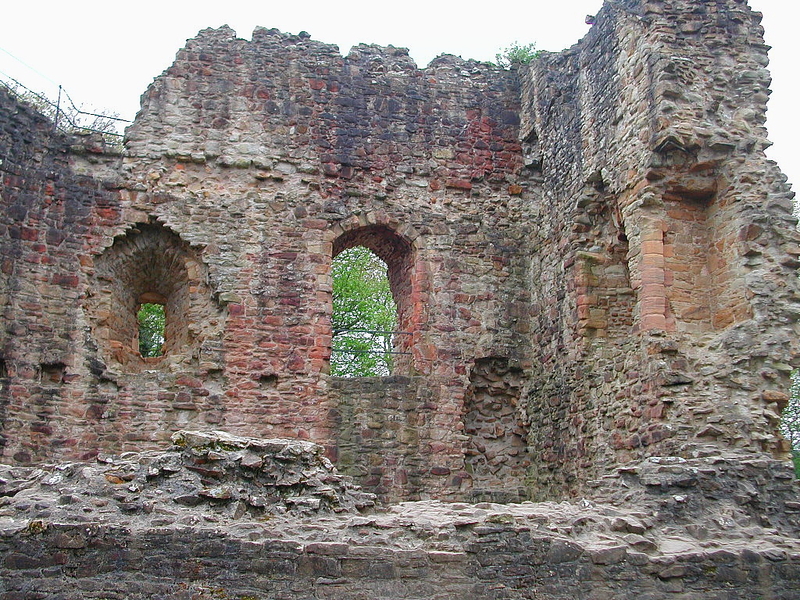 Despite the protests of the owner, William Beauchamp, the keep and the outer bailey were totally demolished and the inner bailey was reduced to half its former height. So ended one great round keep! In Speed's day only the mound and 'old ruins' of the inner ward remained, attesting the thoroughness of the destruction and the accuracy of the accounts! From this we can see that in 1224 a massive stone castle stood in Bedford and that parts of its masonry already dated from 'antiquity'. Other masonry castles must have been of a similar age while the round keep at New Buckenham, Norfolk, is generally accepted as dating to a few years either side of 1140. In this case the historical evidence has been used to support this assertion. Finally of course there is the indisputable fact that rectangular towers were constructed throughout the Middle Ages, of those built at Harlech in 1323-4. If this is true of rectangular towers why then should round towers have been any different? If we can see that round towers were not the preserve of the thirteenth century, what then of the D-shaped towers reputedly built by Llywelyn ab Iorwerth of Gwynedd - Ewloe and Carndochan. True they have D-shaped towers like Y Bere, but does Y Bere mean that Llywelyn could only build such towers? Some at Y Bere are rectangular and one is round. The same is true at Castell Maredudd in the south, yet it is nowhere claimed that Llywelyn was responsible for this structure, although he had made his power felt in this region and was instrumental in forcing the Earl Marshall to return this castle to Llywelyn's princely vassal, Morgan ap Hywel of Gwynllwg, in 1236. On the southern peak at Degannwy there is an open backed(?) D-shaped tower, in the 1240's known as the Mansell tower. Degannwy was certainly a castle of Llywelyn's, as too was Caernarfon. Morlais was built by the earls of Gloucester in the late 1280's, but this too had a fine D-shaped tower similar in many respects to the Mansell tower. Deudraeth Castle had round or D-shaped towers, yet we know that it was built by Llywelyn's elder cousins immediately before 1188. Further, Dafydd a b Owain is said to have held three castles in 1194, one of which was undoubtedly Rhuddlan. Should Ewloe and Carndochan therefore be assigned to Llywelyn simply on the grounds that we have available to us a few fragments of information that show that Llywelyn was capable of building such castles? If his ancestors were capable, then so too might his grandfather have been, the great Owain Gwynedd (d.1170). Had they really co-existed with the Normans for all that time, only to remain incapable of using stone for fortification in a land full of stone? 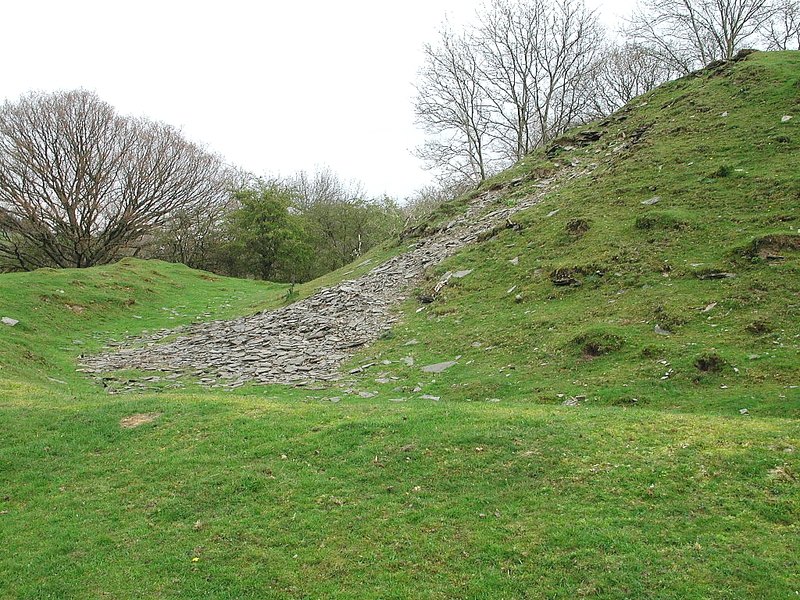 When castle ditches were dug at Welsh castles, more often than not, they had to be rock-cut. What then happened to the stone removed from these operations? Was it left lying around for attackers to use as missiles, or, more likely, did this go into the construction of the castle's defences? Owain Gwynedd's contemporary Rhys ap Gruffydd was certainly a stone castle builder, yet Owain, the recorded builder of stone towers for churches, was not? A lot of facts have been formulated above which I believe directs us towards the conclusion that we are not as secure in our dating methods as we like to think. Even where minutely detailed surveys, excavation and historical research have been combined, it is not possible to state definitively that 'so and so' built this! There are only probabilities and possibilities. Where castles have been firmly attached to a named builder, like Walter Clifford at several sites, this has usually been done through inadequate and wishful thinking, rather than detailed, difficult and time consuming research! What is the way forward from here? The first thing to be done must be the compilation of a list of what is actually known - prior to speculation. This can then form the basis for deeper research. Each castle site must be approached by its historical merits. This takes much time and research, and evidence should not be side-lined just because it does not fit in with a pre-conceived idea or even a universally accepted line of thinking. If this is not done, we run the risk of compounding old errors with new. To avoid this stale repetition is one of the main purposes of my series of booklets on castles and their tenurial histories - to show what is left both historically and architecturally and then to attempt to combine the two to formulate a reasoned hypothesis of a castle's development using available evidence, rather than speculation. After visiting this page, please take the time to visit Mr Remfry's own web site for more up to date information about his published works, and to learn how his research approach to the study of castles is winning widespread acclaim from the academic community. The site features many of Mr Remfry's own photographs, short descriptions of his published works, as well as planned works for the future. Best of all, you can purchase any of Mr Remfry's published titles at very reasonable rates via the easy-to-use order page. Ever wonder what new and exciting things are happening in the field of British castle research? Visit Paul Remfry's web site and find out for yourself!